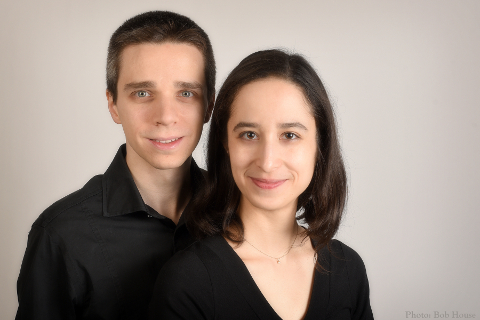 Both Senior & Junior Choirs are conducted by Francine Nguyen-Savaria and Matthieu Latreille. Francine holds a Bachelor in Music (Montreal Conservatory of Music, 2011) and a Graduate Certificate in Organ Performance (University of Southern California, 2013). Matthieu holds a "Diplôme d'études supérieures en musique I" (Gatineau Conservatory of Music, 2005), a "Diplôme d'études supérieures en musique II” (Montreal Conservatory of Music, 2007) and a “Certificat de stage de perfectionnement en musique” (MCM, 2008). They both studied choir conducting with Louis Lavigueur at the Montreal Conservatory of Music. They also took voice lessons with soprano Monique Pagé. While French is their first language and they both learnt English as a second one, they have experience in singing in several languages. In Montreal, Matthieu was choirmaster at both St. Augustine of Canterbury’s Parish and the church of Notre Dame de Grâce. Francine was choirmaster at St. Malachy’s Church. In Los Angeles, they co-directed the choir of St. Ambrose Episcopal Church. They have both received several prizes and awards.